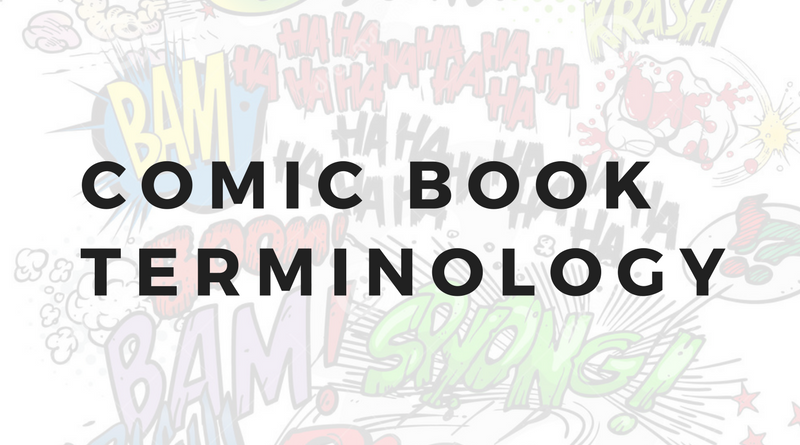 For this week’s How To Get Into Comics, I wanted to cover something that can confuse a lot of people: terminology. Below you’ll find a list of a number of different terms that are broken up into different categories to help things make more sense. This list of terms breaks down the different roles within a comic book, commonly referred to as the Creative Team. Writer – The writer is responsible for the script that the artist (penciller, inker, colourist, letterer, etc.) will work off of. This includes panel descriptions, number of panels per page, the dialogue, captions, sound effects (aka SFX), and any other notes that will help the artist effectively bring the story to life. Penciller – The penciller is the person who lays down the drawings that will be the backbone for the inker. The penciller interprets the script and makes sure that the images on the page represent what’s happening in the story. In some cases, the pencils and inks may be done by the same person, but regardless, the pencils tend to be a looser version of the final product. Inker – The inker uses strong lines and shading to emphasize the work already on the page from the pencils. The inker adds in any additional details needed to tell the story as per the script. Colourist – The colourist does exactly what you might think: they colour the comics. A colourist is absolutely vital to the comic book. The comics medium has grown a lot over the years and now the colours on a comic can make or break how the book looks. They help set the tone, vibe, and just make the comic look a million times better. Letterer – The letterer is responsible for incorporating all the dialogue, captions, and sound effects onto the page. They work off of the script that’s provided and use a specific set of comic book lettering rules to ensure that the page is easy to read and understand. Editor – The editor is responsible for a lot in the book. In addition to normal things like checking for any spelling/grammar errors, the editor is also responsible for tracking continuity, checking over the pencils, inks, colours, and letters, getting the book off to the printers, following up with publishers for vouchers (if working as a freelance editor), and keeping a schedule for the entire team. Single Issue – A single issue (sometimes also referred to as a Floppie) is a 22-page comic typically released once a month. The individual issues make up a larger story arc (think of them as an episode in a season of a TV series). The page count and frequency of publication can change based on the book, but those are the standards. Trade Paperback (TPB) – A trade paperback (or TPB) is a collected edition of a comic book series arc. This usually compiles all the individual issues previously released as Single Issues in one volume that tells a complete story arc (think of this like the complete season of a TV series). Original Graphic Novel (OGN) – An original graphic novel (or OGN) is usually a comic book that stands alone. If it’s a character that is pre-existing and has previous continuity, it’s usually a book that anyone can pick up to learn more about that character and read a storyline that isn’t bogged down by all the other stuff going on. In indie and creator owned markets, this is usually just a self-contained story that anyone can pick up and enjoy. Digital Comics – Digital comics refer to comics that you read on any digital platform such as tablet, phone, computer etc. Digital First – This is a digital exclusive comic that is released online only first and then eventually it is released in print, either in single issues or collected as a trade. Digest – A digest is a smaller format comic book – a digest sized version! Usually with a lower quality paper and many different short stories geared towards a younger audience. These types of comics can be found in grocery store queues and superstore book aisles, making them very accessible to just about everyone. Omnibus – An omnibus is often a collection of either “essential” storylines or a “complete series”. It’s usually a mammoth hardcover book that also includes bonus content such as concept art. Limited Series/Mini-Series – A Limited Series or Mini-Series is a comic that will have a set amount of issues that will be released (usually 5 or 6). This is different from an OGN because it’s released in single issues but will wrap up after the story is concluded. An OGN is released in a complete collected trade and eventually a Limited/Mini will likely be released this way too, but after it wraps up as single issues. Webcomic – A webcomic is a serialized story that’s published on a web site regularly. Creators will release a new chapter periodically (such as every Monday) and are typically free for anyone to find and read. Zine – Indie comic creators will often creator short zines that they’ll publish on web sites or at conventions. They can be as simple as being printed on regular printer paper and folded up like a pamphlet, or more professionally done at a printer. There’s no set rules for a zine! Variant Cover – A variant cover is an alternative to the main advertised cover for a specific Single Issue. Marvel and DC do a lot of variant covers but they’re a big item amongst collectors as they showcase the work of different artists that may not normally be associated with a particular comic book. Panel – A panel refers to one of the boxes on a comic book page. Each box tells a piece of the story on the page and move the plot along. Word Balloon – A word balloon surrounds the dialogue that a specific character is saying. A word balloon also often has a directional arrow that points to the character that is speaking. Splash Page – A splash page refers to a page that only has one panel. The one panel can be laid out many different ways but ultimately one big “spread” or art takes up the entirety of the page. Double Page Spread – In the same way that a Splash Page takes up one whole page, a double page spread does the same but across two pages. This is always done on side by side pages so that readers. Anthology – An anthology collection isn’t something exclusive to comics; it exists in many other mediums. Typically it’s a series of stories done by a number of different creators with one common theme. The Big Two – The Big Two refers to Marvel and DC Comics who collectively take up the largest market share when it comes to comic books. Creator-Owned – Creator-owned means that a specific book is fully owned by the people who created the characters and story. The publisher doesn’t get any say when it comes to the creative rights of the book. Indie – This is usually a broad term that describes pretty much anything that’s published outside of DC and Marvel. Some people believe that Image Comics is no longer indie but as they solely carry creator-owned titles, I still firmly believe they fall in that category. Indie, like in other industries, just means it’s independent. Continuity – Continuity is another term that is found across other mediums. It refers to the consistencies in the story as well as the history of it. Crossover – A crossover is when two pre-existing characters or worlds are in one story. Such as back in The Big Two teamed up to do a a short series called DC vs. Marvel back in 1996. A crossover isn’t exclusive to publishers teaming up, but can also be two characters that you wouldn’t normally see together in a story. Event – A comic book event is a publicity stunt where a large over-arcing story takes over all the properties at a publisher (usually). Marvel does these a lot with Civil War being one of the most famous ones (as an example since this was also turned into a film). Solicitations – These are the up coming releases from a publisher. They tell you the title, a little description of the book, the creative team, and when you can expect it to be released. They’ll also sometimes include a pre-order code that you can take to your LCS (see below) to ensure that they order in a copy of the book for you. LCS – This is an abbreviation that stands for “Local Comic Shop”. It’s something you see online a lot, especially on social media. As always, if there’s something I can elaborate on or clarify in more detail, please let me know. All of these columns are what I’d call “live” so updates can be applied to them at any time. If you use any of our guides to get into comics, I would love to hear about it! Get in touch in the comments, on social media, or by emailing info@creatorresource.com.